Gurgaon-based Angular Technologies Pvt. Ltd, which runs a hyperlocal mobile commerce startup LazyLad, has raised $500,000 (Rs 3.18 crore) in its pre-Series A round of funding from Tekton Ventures' founder and managing partner Jai Choi, Japan-based Sugashita Partners' Kiyohiro Sugashita, and Japanese venture capitalist Hirokazu who have invested in their individual capacities. The company will use the funds to expand into major cities across India and invest in back-end technology, as per a press statement. 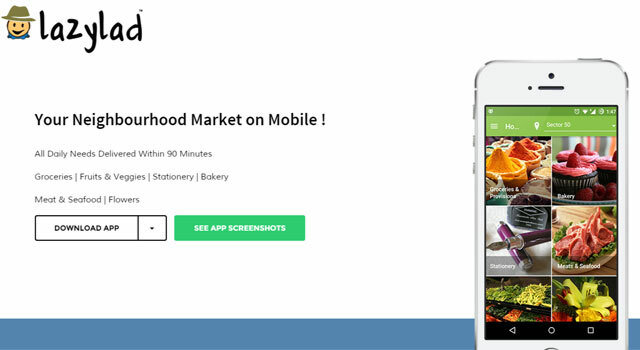 LazyLad's app gives access to neighbourhood retailers in product categories such as flowers, daily groceries, fruits & vegetables, stationery bakery & confectionery items, and meats & seafood. The app is available for Android, iOS and Windows users. The company claims to have listed 200 retailers across these categories, fulfilling about 1,000 orders a day. It wants to add 10 more segments and increase the retailer base to 50,000 by 2015-end. The company also plans to launch the app in Indonesia, Singapore and other developing Asian countries soon. "As India is becoming one of the major economies for internet traffic and commerce happening on smartphones, we found Lazylad's approach to daily hyperlocal goods delivery on mobile very compelling. We look for companies that address large market problems. We believe LazyLad has the right team and approach to becoming a category leader of localised commerce for the India market," Choi said. The company was founded by IITian's Saurabh Singla, Paresh Goel and Ajay Sethi in April this year. LazyLad was the first startup selected for Green House Ventures' (GHV) accelerator programme. It raised about $100,000 in the seed round from Green House Ventures. "A week after getting selected in GHV, we got selected in NASSCOM 10000Startups, and eventually got selected for Innotrek 2015 (which was held in Silicon Valley, the US). This provided us great exposure of what is happening in the Silicon Valley and how that can be helpful in building a unicorn product company in India," said Singla, CEO and co-founder at LazyLad. Sharad Sharma, who is founder of iSpirit, has been mentoring the startup along with Vikram Upadhyaya. "We are pretty excited on having Sugashita, Jai and Hirokazu San as part of our journey," he said. LazyLad plans to raise Series A funding of up to $10 million within eight months. Tech-based hyperlocal delivery startups have become a hot destination for VC funds with a number of startups raising significant capital in recent times. Earlier this week, Bangalore-based hyperlocal delivery startup Opinio raised nearly $1.6 million from Accel Partners. It had earlier secured seed funding from Accel and incubator Tracxn Labs. In April, Grofers, a grocery delivery startup, secured $35 million in funding from Tiger Global Management and Sequoia Capital. Other players in the logistics field include Delhivery, Townrush, PepperTap, LocalBanya and GoJavas. In the delivery technology space, Bangalore-based startup Locus, which makes a delivery automation software, recently secured seed funding.